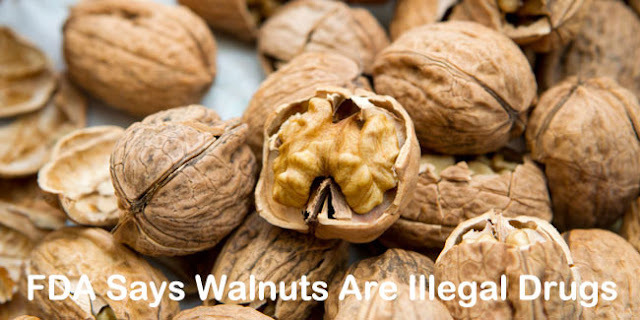 The walnuts you are eating are drugs! Well, at least that is what the FDA says. According to FDA, often referred to as an authoritative agency of food and drug-related tyranny, walnuts could possibly undergo a drug-specialized screening process before they are placed on the store shelves. At least this is the case of Diamond Foods. A small group of Californian walnut farmers started this food company in 1912. The major cause for this is FDA’s disagreement that first appeared when Diamond Foods started promoting the healthy benefits of the regular consumption of walnuts. And the FDA did not approved that. We all wonder why is that. This opposes to the number of studies which showed that walnuts have a significantly positive effect on the overall health and the maintenance of our brain, liver, kidneys, blood, and others. To be more precise, the company explained the high nutritional value of walnuts, outlining the abundance of omega-3 fatty acids. And that is true, you all know that. Diamond Foods also added that these fatty acids provide many health benefits, including a reduced risk of heart diseases and some cancers. Multiple articles and studies have backed up these facts, and dozens of them can be found in the US National Library of Medicine. There is a scientific backing for each of the studies, so it is not like somebody invented the claims and stamped them on the label. Classifying natural and healthy foods as drugs is something US does not need. It is enough with the bad reputation around the prescription medications “miraculously” approved by the FDA, so claiming that these drugs and walnuts belong to the same category is a simple insult. Although Diamond Foods are backed up by scientific evidence that supports the health benefits of regular consumption of walnuts, the FDA still claims that their products are “misbranded.” We guess that the FDA could not swallow the fact that a company promotes health claims that were not approved by the agency, without taking into consideration the scientific support.